Alabama School Connection » Testing – How Much and What’s It Used For? Much of the criticism of Alabama’s College and Career Ready Standards (CCRS) and the Common Core State Standards (CCSS), which are contained within the CCRS, has centered around standardized testing: how much testing and how the results will be used. So let’s look at the facts. Right now, the highest number of days a student will spend taking mandatory standardized tests is three days. 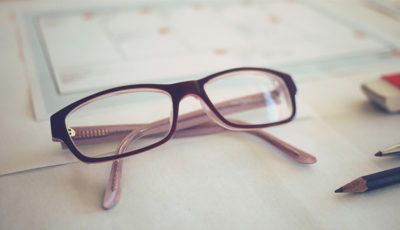 In 2011, an Assessment and Accountability Task Force was appointed by Alabama’s State Board of Education (SBOE) to make recommendations for a complete redesign of the State’s System of Assessment and Accountability. The group met four times in late 2011 and made recommendations in May 2012 to the SBOE of what they considered to be a “balanced” assessment system. 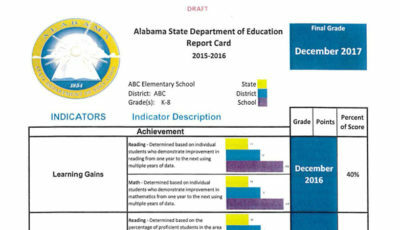 The idea, as explained in these notes, was to put together a K-12 assessment system aligned with the ACT, as the ACT is considered the benchmark assessment in public education in Alabama. Here’s an article from al.com about the May 2012 meeting that explains it all in depth. That recommendation was built upon and vetted with other groups of stakeholders and ultimately the SBOE adopted the full line of ACT products as the assessments to use for grades 3 through 12 in May 2013. 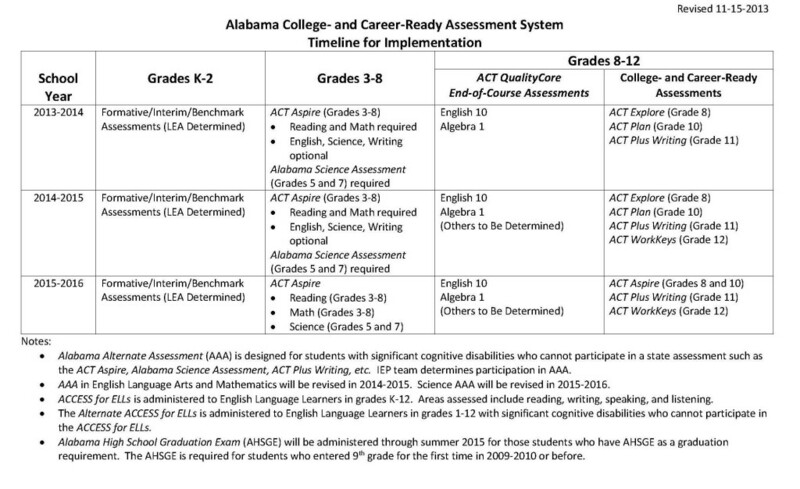 The plan the SBOE adopted originally included a full set of end-of-course (EOC) exams to replace the Alabama High School Graduation Exam (AHSGE), but after cost became a factor, it was decided that EOC tests would only be given for Algebra I and English 10. What follows is the timeline for implementation of assessments for Alabama’s students in public schools. There are two types of testing: formative and summative. Mandated standardized testing is summative. Formative assessments are administered to inform instruction and are used by teachers during the course of the school year to let them know at what level their students are learning. Schools must utilize some form of formative assessments, but the ALSDE did not dictate which test to use. Formative assessment is NOT a part of the accountability provisions under the waiver nor the AAA. To assist school districts who may not be able to afford the cost of formative assessments, the ALSDE used state funding to pay for all school districts to access GlobalScholar’s formative assessments if they choose to do so. Summative assessments are those end-of-year (EOY) or end-of-course (EOC) tests that are designed to measure what the student has learned throughout the year. These types of tests are the ones that are referred to as “high stakes tests” due to their use in punitive and/or corrective measures under the old NCLB measures. 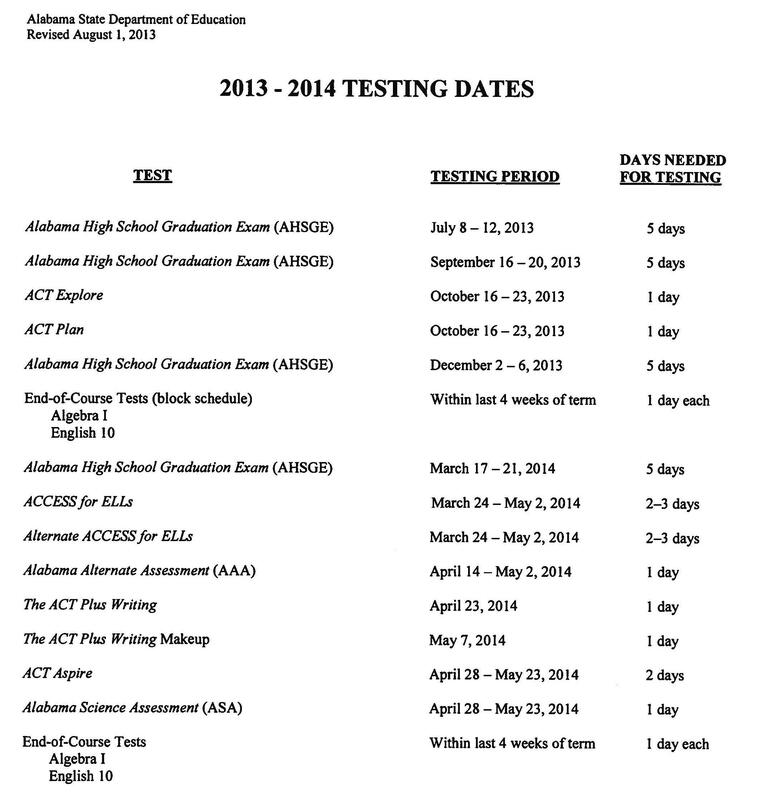 That’s a look at exactly how many days are required for actual testing. As far as how much test preparation goes on? Again, that is the decision of the local district. It is driven by local decisions made by local superintendents, local principals, and local boards of education. What Are Standardized Tests Used For? The schedule of tests, known as the “assessment plan”, became a part of the waiver from No Child Left Behind (NCLB). 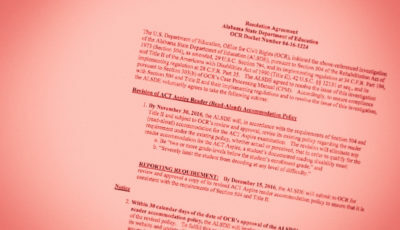 Alabama applied for and received a waiver from the accountability measures under NCLB. This spring will be the first time the “new” tests are given. No schools will be held accountable by either the federal or state Department of Education for the results of this spring’s tests. This spring’s test results will be used to set benchmarks and goals for future years for accountability purposes, and incorporated into the state legislature’s mandate to implement an A-F Grading system (which is overdue based on the letter of the law). 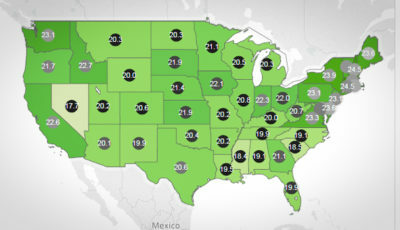 High-stakes testing, where one score can result in a school “failing” Adequate Yearly Progress (AYP) measures, is long gone. Test results are only one part of a big accountability package developed by the ALSDE to get out from under the single focus of the pass/fail prior NCLB measures. 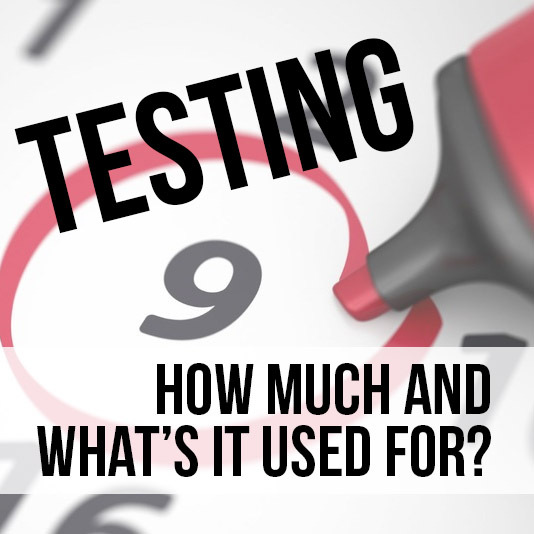 However, it is still unknown as to how results from this spring’s testing will be incorporated into the method us to identify “failing schools” as required by the state legislature under the Alabama Accountability Act (AAA). Within a few years (exact timeline has not been revealed), it is expected that some blend of student achievement measures (including test scores) will become a part of individual teacher evaluations. Committees have been meeting to look at what that might look like and what measures could be used. Stay tuned. And if the legislature passes SB443, this whole plan goes out the window. The bill calls for tests to be delivered in three grades: once in elementary, once in middle, and once in high school. SB443 calls for an “independent testing company” not aligned or a part of any national standards effort to develop the test. Likely it will be no earlier than three years before the tests are ready and reliable results can be utilized to measure progress. The tests, according to SB443, will be based on the standards in place prior to the adoption of the English Language Arts and Math courses of study, which incorporated the Common Core State Standards in those two areas. All testing would immediately cease, with the exception of the Alabama Science Assessment in grades 5 and 7, as no state funding could be appropriated for anything aligned with the Common Core State Standards. This includes the ACT, the test our children take in order to gain admittance to college. This spring, all 11th grade students were supposed to take the ACT with Writing, paid for by the ALSDE. That would be scrapped. So when does SB443 come up for a vote and how do we fight it?